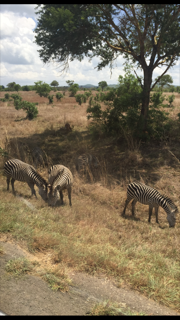 We spotted several animals on our long bus ride and arrived in Iringa where we enjoyed good food and hospitality, as well as beautiful scenery. After catching up on some much needed sleep, we left for Iringa at 7 a.m. and embarked on what seemed to us to be the longest bus ride ever. We all placed our guesses on how long the trip would take, while Lauren ended up taking home the grand prize of 100 TZS (roughly $0.05) with her guess of 11 hours and 50 minutes (actual time: 11 hours and 54 minutes). Congratulations Lauren, try not to spend it all in one place. The bus ride consisted of many fun activities such as card games, sing-alongs, naps, and numerous animal spotting’s. Some of these animals included: monkeys, gazelles, warthogs, giraffes, and Zebras. 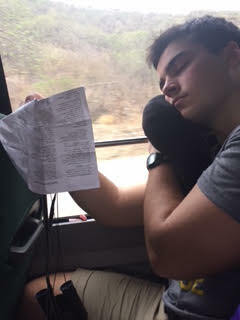 While had fun on the bus trip, we also tried to make time for studying. Trent was so dedicated to learning Swahili that he was doing it in his sleep. After arriving safely at The Lutheran Centre, we enjoyed a delicious three-course meal with cucumber soup as an appetizer, baked potatoes, pork, and mixed veggies for dinner, and sponge cake and ice cream for dessert. The only thing better than the food was the hospitality. Although we will be ringing in the New Year as a group tonight, we will be hitting the hay shortly after due to a 9 a.m. lecture tomorrow. Looking forward to learning more tomorrow, as well as exploring the city of Iringa. You can check this webpage and post your stories there. Consider this option, friend. Alright?